While some view spacious accommodations as one of the benchmarks of hotel luxury, a new vanguard of New York hotels has started emphasizing style over size in a bid to capture more guests with their cozy yet chic lodgings. Smaller rooms means more guests, a clever equation that allows hoteliers to spend even more on the comfort of their guests. High thread-count sheets, for example, are luxuriously de rigeur, as well as higher-quality bathroom amenities, from terrycloth robes to boutique soaps and spa accoutrements. 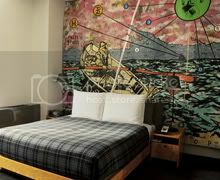 The rooms of the Jane Hotel recall the former tenants of the space—the American Seaman's Friend Society Sailors' Home and Institute of the Institute—with three sorts of "cabins" available. 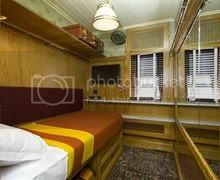 The standard cabin, which shares a communal bathroom with the rest of the floor, is 50 square feet, cozy, with a single bed and luggage rack, television, DVD player, telephone, free wifi, and the austere but homey feel of a cruise cabin in a Wes Anderson movie. 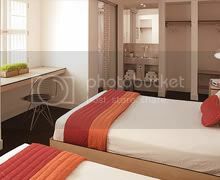 The bunk bed cabin is much the same, albeit with a bunk bed. The captain's cabin, though, is more than three times the size of the other two cabins, with full, queen, or king beds, private bathrooms, and the same amenities as the smaller cabins, although—we would hazard to throw our opinion in here—not nearly as much charm. Morgans, the premier hotel of the Morgans Original brand, is situated perfectly on Madison Avenue, and while the "Superior Room" tops out at 244 square feet, even the smallest of their cozy rooms comes with designer toiletries, premium bedding, cable and satellite television, minibar, and on-site eating from acclaimed restaurant Asia de Cuba. Co-owned by one of the Jane Hotel's partners, The Pod has become so successful with its stripped-down accommodations and low prices that a second location is being planned to cope with the number of reservations the hotel receives. Ideal for those in New York who are visiting to experience the city and not their hotel room, The Pod offers communal bathrooms, guest rooms with minimalistic yet functional design and free wireless internet. Garment District gem the Ace Hotel has already made a humongous splash in the New York hotel industry, with clever collaborations with the No. 7 Sub shop, Stumptown Coffee, and the modern pub and restaurant The Breslin, which has received high praise from critics. This is in addition to the Ace Hotel's swank, place-to-be lobby bar, and guest rooms with fully-stocked minibars, wireless internet, homey furnishings and linens, plenty of artwork, and an unbelievably comfy feel. Don't forget: The New York City Experts at NYC.com also offer a fully comprehensive guide of New York Hotels as well as an entire Visitor Guide to New York!